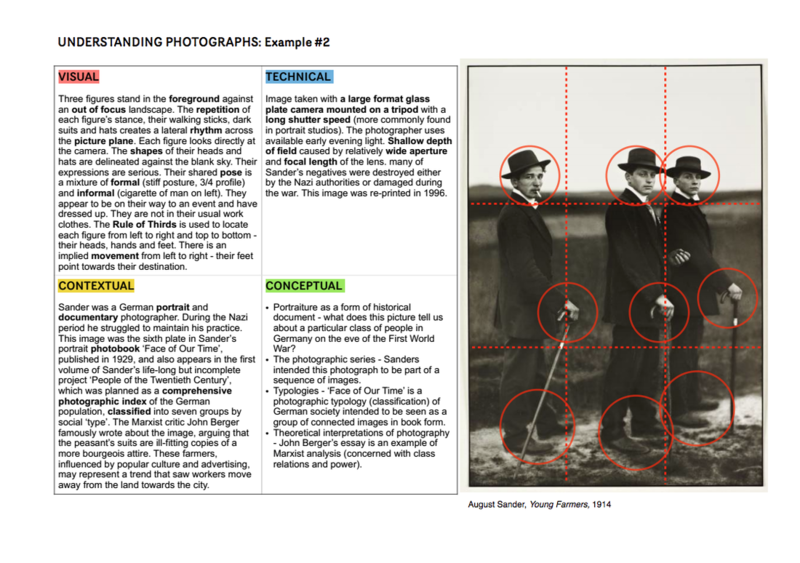 What does it mean to be literate in photography? 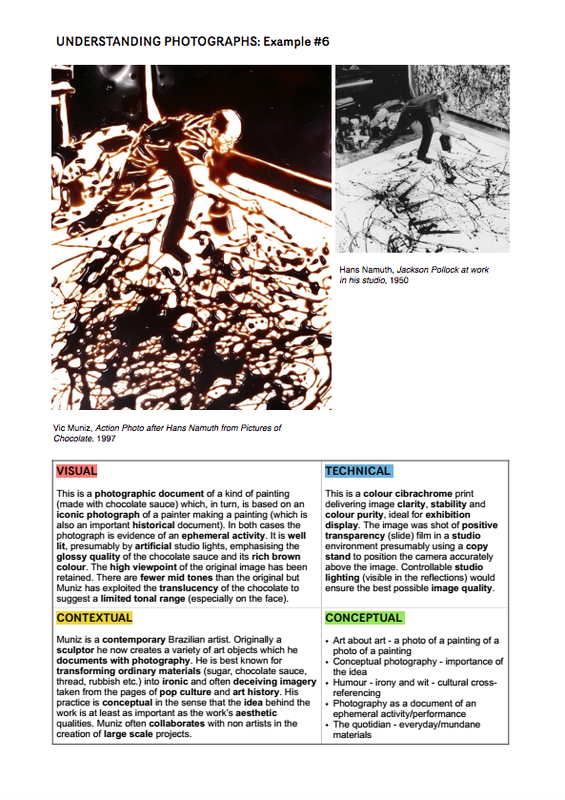 Superficially, it might suggest an ability to 'read' a photograph, to analyse its form and meanings. But what about the making of photographs? We would argue that literacy is more than just a command of the mechanics of a particular 'language'. It also takes into account fluency of expression and sensitivity to material. Words and images are different. 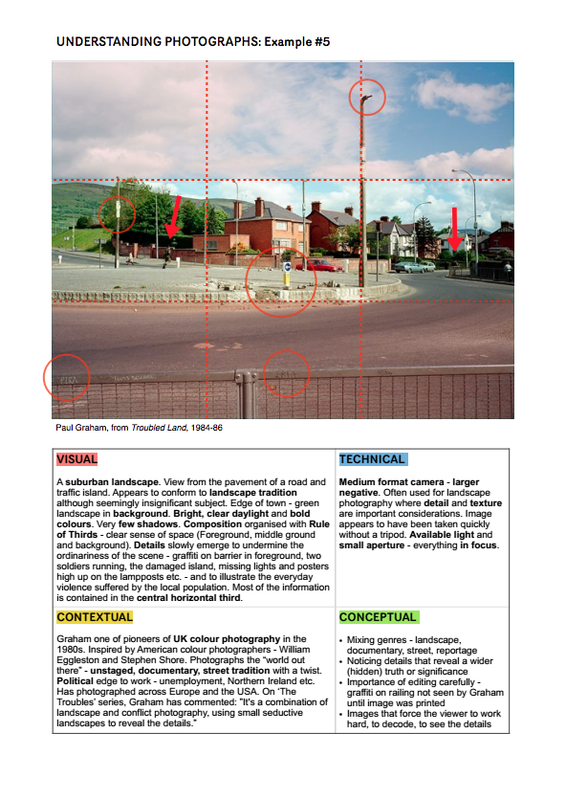 A photograph of a particular subject is different to a description of the same subject in words. It is surely possible to see, understand and appreciate a photograph without the need for words. And what about the other possible 'literacies' such as emotional and physical literacy? Most photography courses require some evidence of understanding in the form of words. Chris Francis' advice about the A level Personal Investigation tackles some of the opportunities and challenges of extended writing in an art & design course. 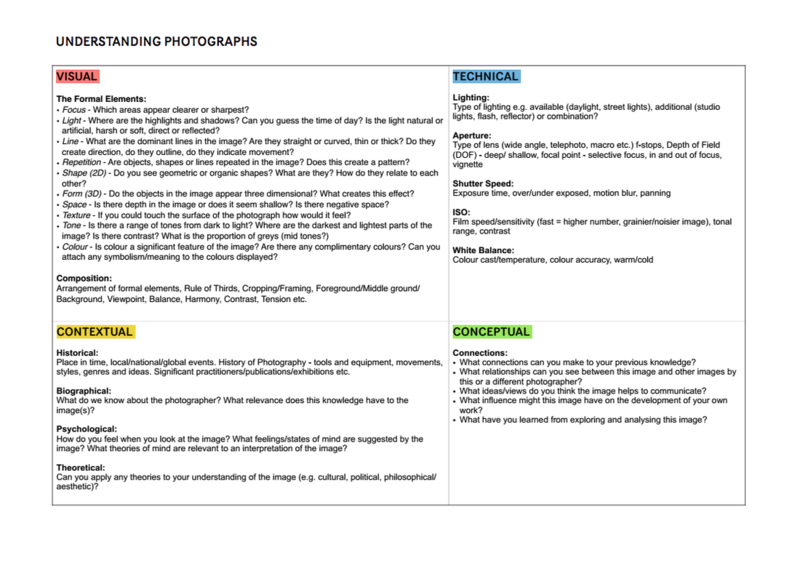 The resources on this page of the site are intended to support the analysis of photographic images using words but also to provide other frameworks for thinking about students' progress. These include the ability to listen thoughtfully, participate in discussions and debates, articulate thoughts aloud, become increasingly self-directed and exert control over one's physical movements. Photo Literacy is therefore a specific type of understanding that combines visual, linguistic, emotional and physical acuity. Bloom's original taxonomy for the Cognitive domain put evaluation at the top of the pyramid. In 2001 Anderson and Krathwohl redesigned the pyramid, changing nouns to verbs and adding 'create' to the top of the pile. The other domains are Affective and Psycho-motor, both very relevant to the study of photography. We'll come to those later. In the example below the levels have been adapted slightly to reflect a typical visual analysis process. Chris Francis outlines his approach to using the SOLO taxonomy in this blog post, some of the contents of which are re-posted below. Like Bloom's Cognitive Domain, the SOLO (Structure Of Learning Outcomes) taxonomy presents a classification of learning from prestructural (lower order thinking) to extended abstract (higher order) thinking but with the aid of some handy symbols. Prestructural: the student learns some unconnected information. Unistructural: simple obvious connections are made but their significance is not fully grasped. Multistructural: several connections are made, but the meta-connections between them are missed, as is their significance for the whole. Relational: the student is able to appreciate the significance of the parts in relation to the whole. Extended Abstract: the student is able to make connections not only within the given subject area, but also beyond it, able to generalise and transfer the principles and ideas underlying the specific instance. 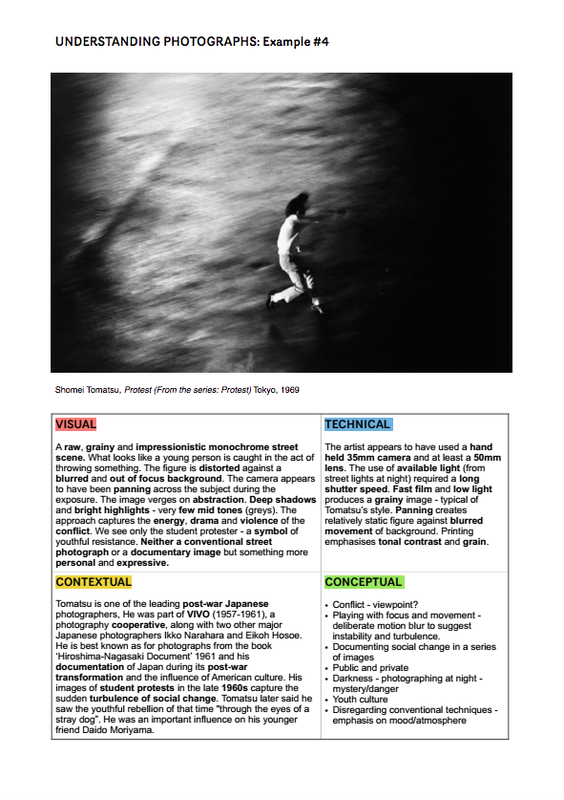 There is so much great writing about photography available to teachers and students. One way of developing students' photo literacy is to share with them some of this writing, in the context of their own explorations and visual analysis. 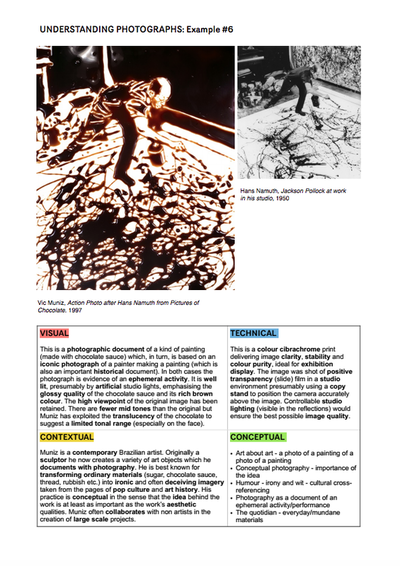 Fluency in the use of written language (and the ability to think with it) stems from oracy, so creating the conditions for great discussions and debates about photographs is a crucial part of the process of developing photo literacy. Teachers (and fellow students) are then able to model the use of technical vocabulary and imaginative turns of phrase. We also believe that teachers working alongside students can model the process of thinking. This can be a complex process of testing ideas, taking imaginative risks and changing one's mind. Writing together and sharing this aloud, as well as in a printed form, is also useful. Various web based tools (like Google Documents) are available for collaborative writing and editing. The Affective and Psychomotor domains are less well-known than the Cognitive. We believe that these present some interesting frameworks for reflecting on the way photography students make progress and become more literate in the subject. In philosophical terms, we believe that arts subjects like photography present students (and teachers) with ways to shape their values (axiological) and orientations (ontological), their sense of being in the world, their relationship to ideas and their growing sense of self. The Affective Domain includes the manner in which we deal with things emotionally, such as feelings, values, appreciation, enthusiasms, motivations, and attitudes. These attributes reflect the current interest in character education. They represent a kind of literacy of the self. 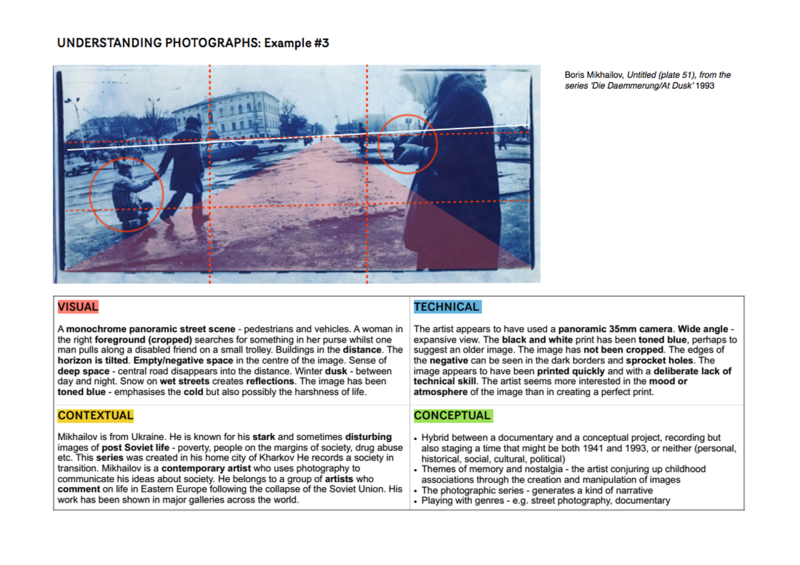 We would argue that the particular affordances of photography courses provide teachers with opportunities to support the development of students' value systems and emotional resilience. ​Self-reliance, ethical behaviour and valuing others are the hallmarks of a great photographer. How does this photograph (or this photographer's work) affect your view of human relations? What do you think is the relationship between photographer and subject? What might others think? What do you find most challenging/puzzling/confusing about this photograph/project? Which ideas about photography have been most influential for you so far? How do you respond when you feel stuck? How might you develop your persistence and tolerance of uncertainty? How might you collaborate with others in solving this creative challenge? How might you become more self-directed in your studies? Which aspects of the course do you need to develop most? What are the ethical challenges for photographers? When might it not be appropriate to make a photograph? There are various different versions of this domain which deals with physical movement, coordination, and use of the motor-skills. 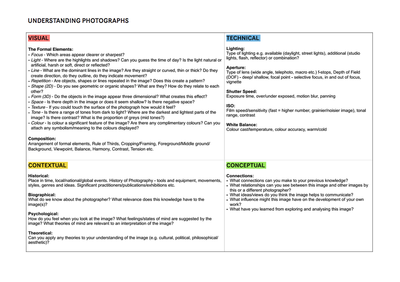 Development of these skills requires practice and, in terms of photography, can be demonstrated in the way students deal with equipment, processes and materials in a range of working situations. ​For example, commentators have written about seeing photographers like Henri Cartier-Bresson or Robert Frank working on the street - alert, graceful, explosive. 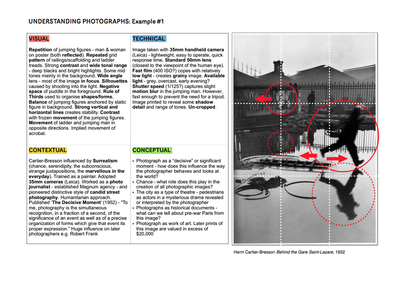 ​Photography is an embodied kind of learning requiring a physical literacy (haptic intelligence). Photographs are made with the whole body, not just the eyes and the brain. How might you use what you have just witnessed in your own work/practice? Explain how you might use a range of techniques/processes to create a response to X? How might you refine/develop your use of X technique/process? ​How do you know when X technique/process has worked well? What do you find most challenging when using your camera and/or working in the darkroom/studio? What physical attitudes/behaviours work best in different shooting situations E.g. on the street, in the darkroom, in the studio? What happens when you change the aperture settings on a camera? How might you achieve a shallower Depth of Field in your next image? Why do photographers experiment with focus? What can we learn from the f.64 group's attitude to focus? How do you feel about the relationship between focus and subject in X's photograph? How might you adapt your approach to the use of focus in the future? In 2013 Bill Lucas, Ellen Spencer, and Guy Claxton produced a paper for CCE entitled ‘Progression in Student Creativity in School’. They proposed a set of Habits of Mind that form the basis of creativity. These dispositions combine many of the descriptors from the various taxonomies of learning. Thomas Tallis School has adopted this set of Habits of Mind as the basis for assessment at KS3 and beyond. 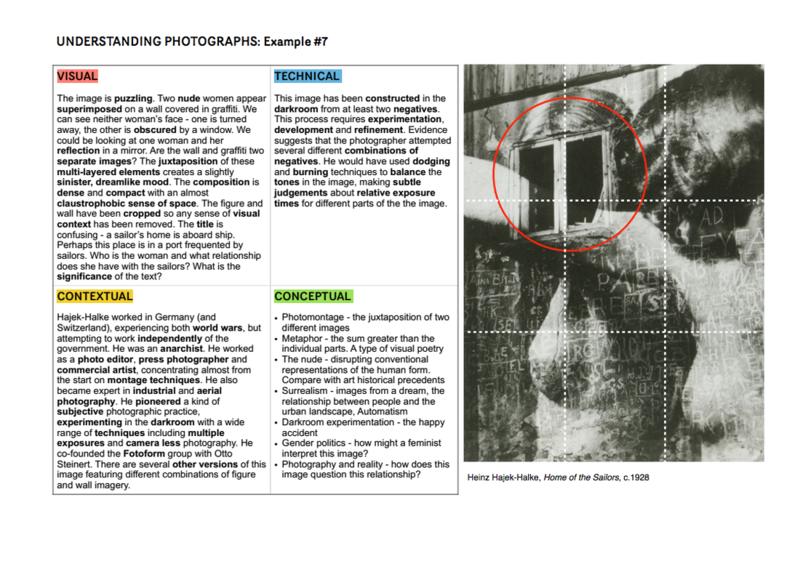 With regard to photography at KS4 and 5, the Tallis Habits are used explicitly to develop students' cognitive, affective and psychomotor abilities.